I have mentioned that we have purchased a portion of a cow. It is grass-fed beef from a ranch in Petaluma, CA (for those of you that don’t know and are curious, that is north of where I am, past San Francisco). It is very good meat. My favorite is the ground beef, hamburger meat. The family that allows us to go in on the cow with them generously alloted us a large portion of it. But we don’t get JUST hamburger meat, we get other cuts, too. And again, the family generously worked with me and my loathing of bones and they gave us a lot of cuts without bones. But some cuts are going to have bones. But I really don’t work well with bones. I really don’t work well with a lot of these cuts because I just don’t know what they are and I don’t know what to do with them. The last two portions of meat I cooked were bad. Bad as in, I didn’t cook them properly so I couldn’t eat them. They were to tough or stringy or whatever, they were just not good. My husband gnawed his way through them, and he won’t say anything bad about beef for fear of not getting any. So he said they were ok, but, for me, they were not. Often I just don’t bother because I don’t know what to do with it (the cut of meat). But that means we have a few pieces left over from the last cow and now we have a new one, so I need to just cook it. The other day I took some steaks out and texted my friend with this picture and a “How can I cook these, Chef?” And she said, “Like you would ribeye steaks. Grill high 2-3 min per side :)” Made me laugh because I don’t know how to cook ribeye. I don’t “grill”, so I decided to use my grill pan. I must say they came out really, really good. So good that hamburger might not be my favorite any longer. So good that I decided to cook them again . . . the next night. Ok, not really, I mean, really, but not. I decided to cook them again the next night because we have nothing but beef in our freezer. I thought we had something else, but we do not. So I was going to cook them two nights in a row, but they didn’t defrost in time. So . . . I am cooking them tonight. And they were so good I decided to post about them. I just poured into the dish, but guessing I would say about a cup of red wine, three tablespoons of soy sauce, two tablespoons of Worchestire sauce, and just a little of both of the teriyaki (because I didn’t have that much). I used the same “recipe” for tonight’s meat, but I was able to let it soak longer. Then for MY steak, which I like cooked a little more than my husband, I turned the stove on right below medium and buttered it the pan. I put the steak in the pan . . . . you will see that all the fat and bone are cut off my piece. I cooked it for a few minutes, with butter on top and some rosemary rub. Then I flipped it and cooked it a few more minutes. Then I turned up the heat a little bit – to medium, then I flipped it again and cooked it a few more minutes. Then I turned up the heat so that the pan would get really hot. I put my husband’s pieces in. I didn’t leave mine on that long on the high heat, only as long as it took me to put hubby’s steak in and butter on it. I cooked them both for a few minutes each side. They came out perfect. But remember, grass-fed meat does not look the same as commercial grain-fed beef, so it looks raw, but it is not. I served it with potatoes and salad! This entry was posted on January 20, 2016 at 9:40 pm	and is filed under "Recipes", Food. Tagged: cooking beef on a grill pan, grass-fed cow, grassfed beef, Petaluma farm, steak. You can follow any responses to this entry through the RSS 2.0 feed. You can leave a response, or trackback from your own site. Ha! Don’t even know what a ribeye is. You know me. I don’t know cuts of meat. It is either beef, chicken, or pork. That is about all I know! I know you always tell me I can text you. But I don’t want to bother you. And, as I said, John like it. I didn’t. I cooked a roast I didn’t like and a steak. I don’t remember what it was. 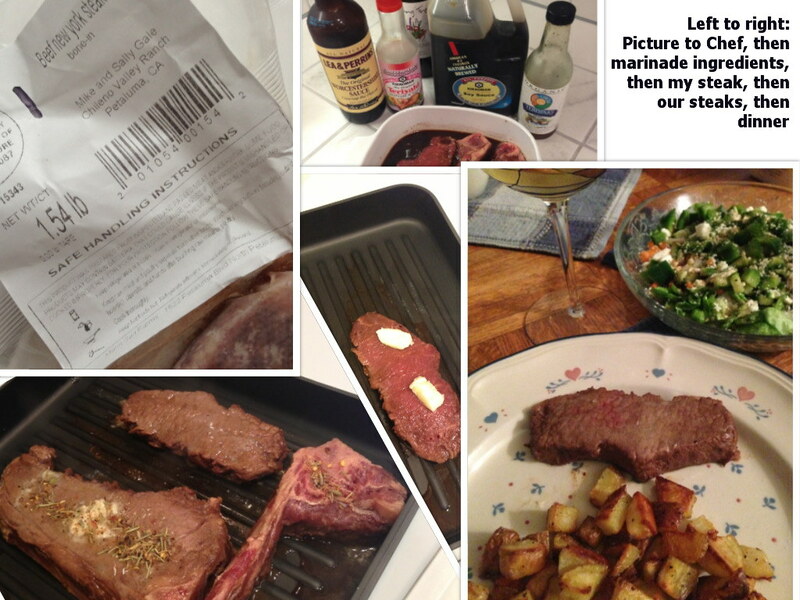 It really boils down to – I can’t cook every piece of meat the same. Drat! But these four came out really, really good. I think butter is awesome on steak!